On January 24th Stacks Bowers sold the finest known 1792 Half Disme (pronounced Deem) certified by NGC as MS-68. Part of the Cardinal Collection, the coin was offered as lot 13093 and realized $1,145,625. Even tough this was substantially less than the last time the coin traded hands (it was reportedly sold to the Cardinal collection for $1,500,000 in 2007) we still think this is an important coin that deserves it’s own article. The 1792 Half Dismes were reportedly struck in the cellar of John Harper at the special request of George Washington, who reportedly provided the silver for the coins himself (some sources say by using the silverware of his wife Martha) and who used the coins as gifts to (foreign) dignitaries. Judging by the uncommonly high number of circulated examples that exist, however, it appears that many people that received the coins eventually spent them. Whether or not any of this is true is not even confirmed; many authors have tried putting the story together from both first-hand and other sources, as was also outlined in the auction description which includes as much information as is known about these fascinating pieces. 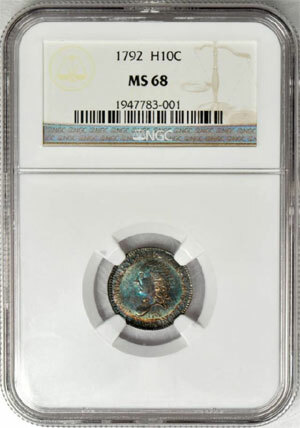 As mentioned, the NGC MS-68 that was sold at the Stacks Bowers auction is the finest known, with the other notable high grade example certified by PCGS as a specimen striking, SP-67 (it had previously been graded by PCGS as an SP-66 but got upgraded). The NGC MS-68, however, is particularly interesting because of its pedigree, which can be traced back to the day it was minted in Philadelphia in 1792. Pedigrees can tell us a lot, and coins pedigreed to major collections such as Eliasberg can often sell for a premium, simply because a famous collector used to own a coin. This is especially the case with ancient coins, many rarities which can be traced back to sales from the 19th century, or sometimes even earlier. For American coins, however, one must realize that there were very few collectors of American coins prior to the 1850s, and any coin with a pedigree that dates back to before that can be considered a rarity. A coin such as the 1792 NGC MS-68 Half Disme that traces it’s pedigree back to the day it was minted is not only extremely interesting for numismatists, it also is extremely rare. Mint Director David Rittenhouse (First Director of the Mint) was the first owner of the coin, probably along with numerous other examples. It remained in the Rittenhouse family until 1919, when the coin was first sold publicly in a Chapman sale, realizing $56. It was sold again in 1921, after which it disappeared off the market until 1988. It traded hands several times before 2007, when it was placed in the Cardinal Collection by Jay Parrino for the aforementioned $1.5 million. The coin itself has obviously been taken care of ever since it was struck, as there are virtually no imperfections on either side. The coin has a very strong strike with full luster, and blue-green-orange toning, most likely from storage in an album for many decades, perhaps between the sale in 1921 and the subsequent sale in 1988. It was one of the highlights of the Cardinal collection and while the relatively low sales price might have surprised some people it still is a very rare and desirable coin with a fascinating pedigree and excellent eye-appeal. Sign up to receive a daily round up of coin collecting news and articles delivered three times a week.